Barbara Zietsman has long had the dream to drive a wedding carriage and add to the love and joy of this momentous occasion. Picture arriving at your wedding in a beautiful canopied vehicle, painted dark burgundy – almost black – with red burgundy wheels and black button quilted upholstery. You will make a fantastic entrance drawn by our very special Shire horse, Miss Molly Potts, who is a wonderful dark, shiny chocolate brown. With roses and ribbons in her mane, it makes a wonderful picture. Molly is a competition horse and used to noise and crowds, she is absolutely dependable no matter what. She has a well developed sense of occasion and certainly enjoys all the pomp and ceremony. Included in the cost of the Carriage service is transport (within a 40km radius of Nottingham Road), as well as an allocated amount of time. To book Barbara, the carriage and Miss Molly Potts please telephone Barbara on +27 (0)82 854-5698. 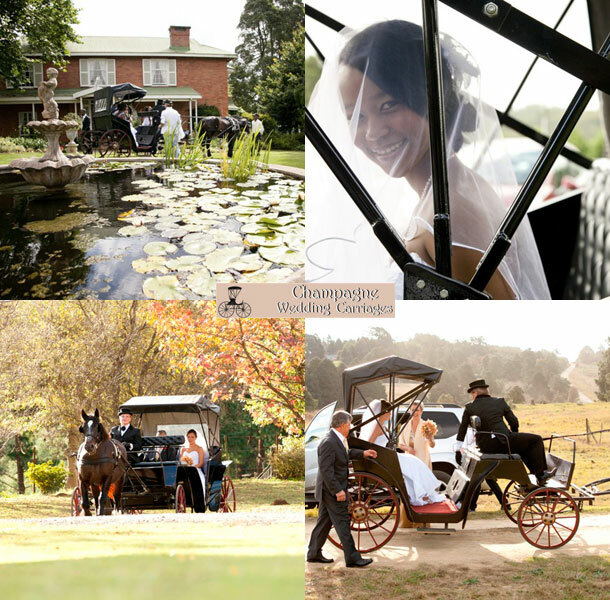 Alternatively for further details or to send an enquiry visit Champagne Carriages.